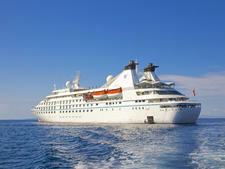 The 212-passenger Star Breeze, which joined Windstar's fleet in May 2015, is a yacht-style small cruise ship -- not one of the sailing vessels for which the line is known. 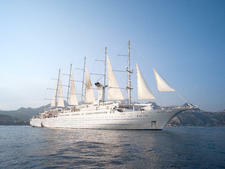 Acquired from Seabourn, the ship offers Windstar's breezy, relaxing and casual ambiance, while offering more spacious cabins and additional lounges, as compared with the line's original vessels. 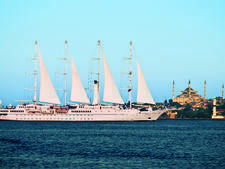 Longtime Windstar sailors appreciate the extra space, but miss the romance of sail-away; new and former cruisers will enjoy the breadth of itineraries available, with calls at places both on and off the tourist track, and the camaraderie onboard. The ship received a significant refurbishment before joining the fleet with an $8.5-million investment applied to public spaces like the theater, lounges and AmphorA, the main restaurant. (We adore the top-of-the-ship Yacht Club, a sprawling lounge with a coffee bar, snacks and sandwiches, and plenty of cozy armchairs.) Cabins on the all-suite ship were modernized, with new bedding, upholstery and electronics. Most significant was the complete overhaul of the ship's sun deck, which was never a strong suit for this particular ship design (even when part of Seabourn). It's much more open and pleasant, and has become quite a social hub on the ship; however, be warned that there is no full-sized pool. The big difference between Star Breeze and its sailing brethren is that it feels a little bit more like a traditional cruise ship. Cabins are significantly larger than those on Windstar's sailing vessels, and all have either French balconies or large picture windows. The large marble bathroom with double sinks is a plus, as is the walk-in closet that's standard in all categories. 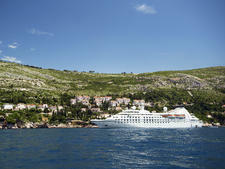 However, unlike a brand new cruise ship, this one feels more like a fancy boat than a hotel at sea. It's got more of that ship smell to it (a mix of sea water and fuel that is noticeable in certain areas), and when seas are not totally calm, the ship rolls with the waves. Planned entertainment is minimal, with passengers expected to explore ashore or entertain themselves onboard with sunbathing, good conversation or cards/books/movies. For the nautical folk who flock to Windstar, these factors can be a plus; those who get seasick or want more of a traditional cruise experience might not be the right fit. When it comes to levels of luxury, Star Breeze -- and its sister ships -- are in a class of their own, somewhere between the ultra-luxe lines and the more utilitarian expedition vessels. Food and service is good, but it won't wow you like on the most high-end lines. Nonalcoholic beverages (soda, coffee, juice) and meals in all onboard restaurants are included, but you'll pay extra for gratuities, alcohol, shore tours, WiFi and laundry. The size of the ship is a highlight; it enables it to visit more off-the-beaten-path destinations (it carries Zodiacs for beach landings), passengers to make friends, officers to open the bridge to curious travelers and staff to learn your names and put on memorable deck and beach parties that are a real perk. Yet it contains enough creature comforts to make you feel you're on a yacht and not a bare-bones research vessel or a crowded, amusement park-like mega-ship. At the end of the day, Star Breeze is a lovely home for active travelers who want to explore new destinations in comfort but need neither constant entertainment nor the ultimate in pampering to have an enjoyable vacation. 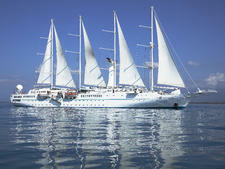 Windstar primarily markets to English-speaking passengers from the United States, Canada, the U.K. and Australia. Passengers typically are well traveled and active, and range in age from 40 to 75, with a smattering of those older and younger. The line attracts a high number of repeat cruisers; for example, on our sailing 82 out of 201 passengers had previously sailed with Windstar. Aim for no-fuss upscale casual clothes. During the day, most men sport Polo shirts or T-shirts, and shorts or khaki pants, depending on the port stop. Expect lots of Ralph Lauren, Brooks Brothers and Lands' End for the guys. For daytime, women wear shorts, capris, pants, silk and cotton tops, and sundresses. On Costa Rica cruises, zip-off pants, SPF clothing and moisture-wicking tops from the likes of REI are prevalent. In the evening, women add simple jewelry and perhaps a fancier blouse or light sweater to slacks or a skirt. Some wear floor-length casual dresses. Men wear slacks and two-button or button-down shirts. AmphorA, the main dining room, discourages shorts, jeans, tank tops and sneakers. Don't bother to pack suits, ties, tuxedos or evening gowns. The onboard currency is the U.S. dollar. An automatic $13.50 charge is posted to each passenger's account daily. You can amend that amount up or down, as you like. A 15 percent gratuity is added to beverage bills and spa services. For extraordinary service by specific crew members, some passengers hand out additional tips at the cruise's completion. The 148-passenger Wind Spirit sails French Polynesia year-round; its small size, stellar service and water sports marina make you feel like you're on a private yacht.